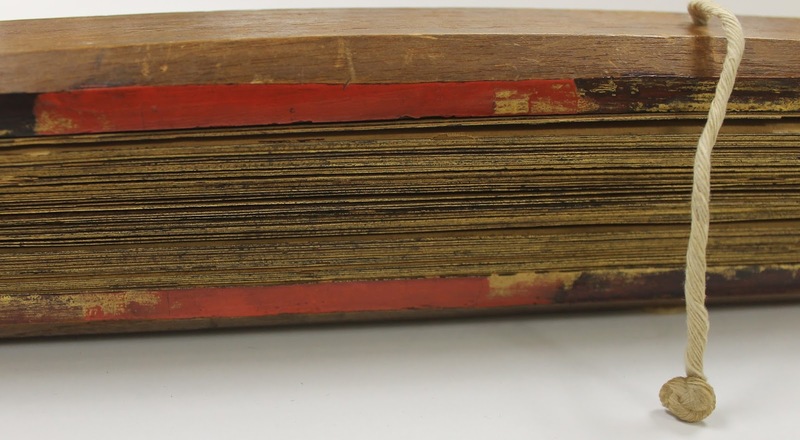 The Brandeis Archives and Special Collections Department is fortunate to own two 19th-century Burmese Buddhist texts, handwritten on palm leaves. Donated by Philip Pinsof, these make up part of the department’s Rare, Non-Western Manuscripts collection. The language of both manuscripts is Burmese but the exact dates and origins of the manuscripts are unknown. The more complete of the two manuscripts in Brandeis’s collection (#38) is composed of, literally, sixty-six leaves – rectangular, dried, cut, and smoked Palmyra palm leaves, or peisa – on which, using ink, a scribe has copied what is most likely a Buddhist text. The handwriting is beautifully clear, with little decorative flourish. The leaves measure roughly 5 cm wide by 50 cm long, and the manuscript is bound on each side with a wooden board. 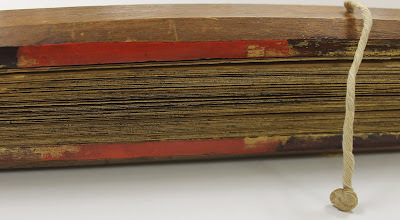 The edges of the two protective boards have been painted in red and maroon, and the edges of the manuscript leaves themselves have been gilded. The whole piece is held closed with two fabric cords which pierce the leaves and wood at either end, and allow the reader to open the manuscript like a fan. The second manuscript, #39, is a fragment of 25 palm leaves, tied with fabric cords threaded through the leaves, but without the protective boards. This is believed to be a Buddhist history of priests. The use of palm leaves as material for manuscripts has a long tradition, dating to the pre-paper era - it is believed they were being used as far back as 5 CE. Likely having originated in India, palm-leaf manuscripts have appeared throughout South and Southeast Asia. It is believed that the initial durability and toughness of palm leaves made them ideal for Buddhist monks and others to use them as a writing surface, and, “unlike wood and bamboo, palm leaves require a simple manufacturing process of boiling and drying to render them suitable for writing.”(1) Unfortunately, due to the high humidity of the climate in Southeast Asia, palm leaves decay rapidly, and therefore it is rare to find examples of these delicately constructed manuscripts that are more than 200 years old. In fact, it was common practice to copy the manuscripts to new palm leaves as the old ones weakened and began to disintegrate. This practice only came to an end relatively recently, in the 19th century, with the advent of industrial-scale printing presses. (2) Most of the older examples which have been preserved are generally those that were carried by Buddhist missionaries to Central Asia, where a colder, drier climate – one less destructive to the materials – was prevalent. 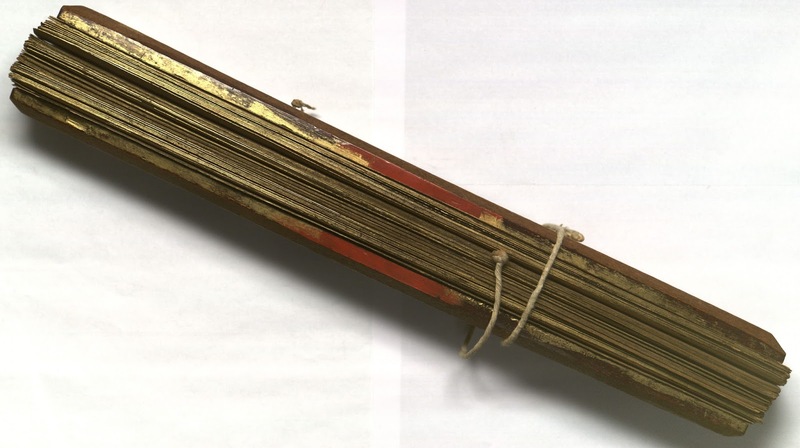 The earliest surviving palm-leaf manuscript dates to 9th century Nepal, and the most recent examples to be found date (like Brandeis’s manuscripts) to the 19th century. 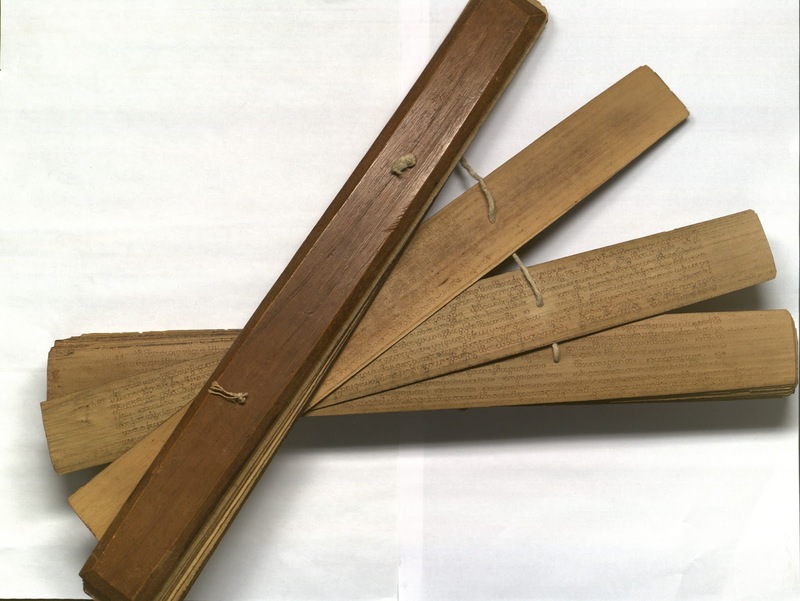 Some scholars believe that the physical nature of the palm leaves was actually a central factor in the development of rounded scripts in Southeast Asia. Rounded writing would have been easier to copy onto leaves without causing damage to the writing surface, while more angular scripts were likely to split the leaf. (2) As well, the shape of the palm leaf itself was copied and can be seen in manuscripts made from a wide variety of materials, such as birch-bark (India), cotton cloth (Burma), and copper-plate charters (South and South-east Asia). “After the introduction of paper to India by the Muslims in the early 13th century, certain types of manuscripts retained the characteristic oblong shape of palm-leaf manuscripts and even the blank space in the text, originally left by the scribe to provide room for the cord; this became a focal point for decoration.”(3) Compared to the more ornamental Kammavaca palm manuscript (generally used for formal monastic ceremonies), the palm leaf manuscript is rather plain, yet still beautiful in its own way. Brandeis’s two palm-leaf manuscripts are available to all visitors to be viewed by appointment. (1) and (4) Ward, Gerald W. R., (editor). The Grove Encyclopedia of Materials and Techniques in Art. Oxford University Press, Oxford: 2008, p. 356. (2) Wikipedia. Palm-leaf Manuscript. Accessed June 6, 2016. (3) Steever, Sanford “Tamil Writing;” Kuipers & McDermott, “Insular Southeast Asian Scripts,” in Daniels and Bright, eds., The World's Writing Systems, Oxford University Press, New York: 1996, p. 426, 480. Description by Max Close, recent History graduate and former Archives & Special Collections assistant.